In this article I go over the concepts of Processor Expert and how I’m using them in my applications. I have used it in many customer and research projects over the last years. As a tool might not fit every use case, I try to list the pros and cons how I see them. I don’t know the full history of Processor Expert by any means, so here is just what I know and was able to gather: Processor Expert is a tool who has been developed by Unis, starting around 1994 in Brno, Czech Republic. I started using that tool around 1998 and later with the ‘classic’ CodeWarrior using the Motorola/Freescale HCS12 and HCS08 microcontroller. At that time, Processor Expert technology was independent and available for non-Motorola/Freescale processors too, e.g. for Fujitsu. In 2001, it has been awarded the European IST price. 💡 The European IST price is mentioned in web documents, but this IST organization/web page seems not to exit any more? The technology has been acquired in 2008 by Freescale and supports Freescale only processors by now: HCS08, HCS12(X), DSC, ColdFire, i.MX and Kinetis. At the beginning, the tool was available as a ‘standalone’ version (without IDE), but then has been integrated by Metrowerks into CodeWarrior IDE as plugin. Today it is available as plugin in Eclipse (e.g. 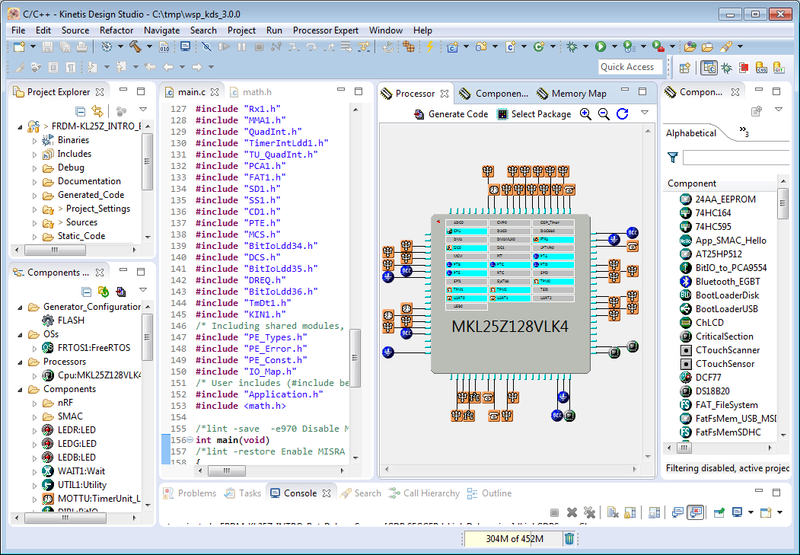 Kepler, Luna) or integrated in Freescale Kinetis Design Studio, and runs on Windows, Mac OS X and Linux. Develop a working application very fast. Needs time to learn the tool. Has built-in knowledge base, sometimes better than the reference manual. 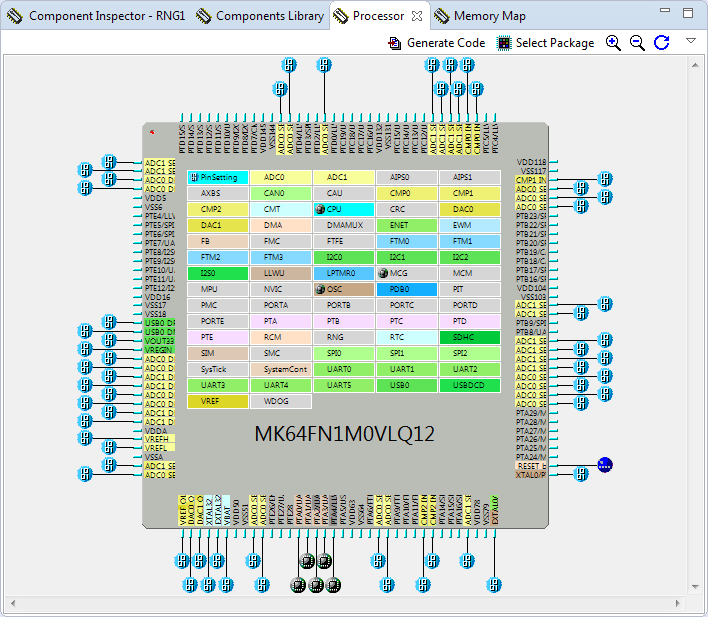 A solid understanding of microcontroller is still required. Integrated into Eclipse and CodeWarrior IDEs. Other non-Eclipse IDE’s like Keil or IAR need to use it as external tool which is not that user friendly. 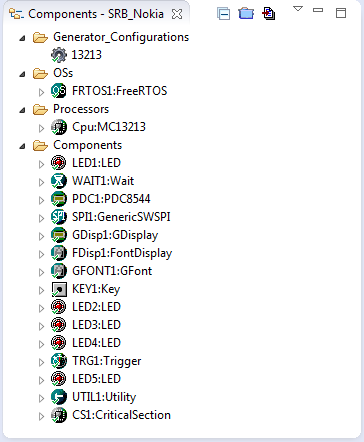 The concept of Processor Expert is that it I can select ‘components’ from a Component Library to use and combine them in my application. Components are like ‘Lego Blocks’ with interfaces which can be put together and which can be configured. Based on this configuration, it then uses a Code Generator to produce normal C/C++/Asm source files. 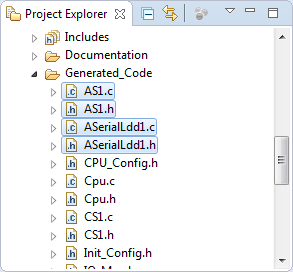 Beside of the source files, that code generator produces report and documentation files. Together with my source files they get compiled/linked to build the ELF/binary file for my board. Ability to do rapid prototyping with components from the library. 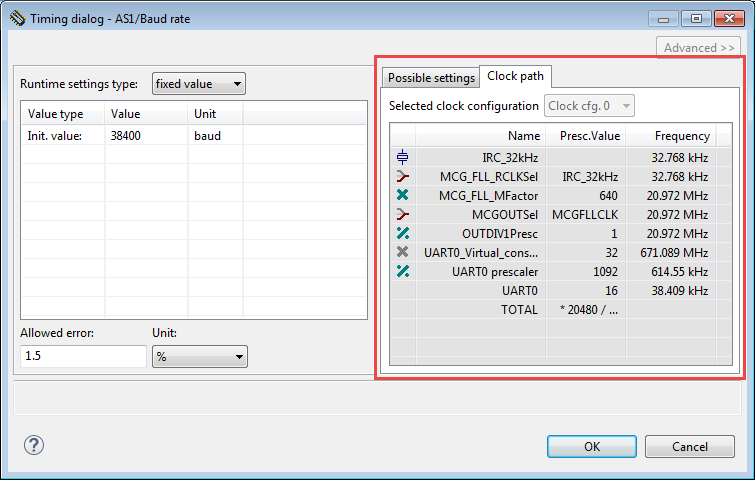 Depend on availability of component for devices, not all Freescale devices are supported. Source files optimized and generated based on my settings, the generated code is static. Safety coding rules can prevent any ‘generated’ code. Using a new version of the tool can affect code generated, needs re-certification of application/code. Sharing of common code and library functions. Code generation especially for many modules can slow down a full build of the application. The component library has ‘blocks’ for reading in analog values (ADC) or toggling pins (Bit I/O) up to more complex things like communication stacks (USB) which itself can contain several sub-components. Components can be very hardware specific (like a UART), or can be pure software components like one to implement a ring buffer. An installation of Processor Expert comes with many components included. 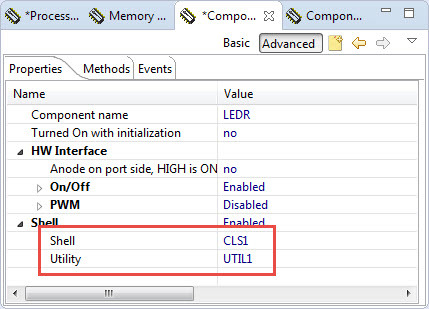 It is possible to create your own components using the CDE (Component Development Environment) framework. Reusing common blocks as a library in application. Up until recently (Processor Expert for Kinetis v3.0.0) it was not possible to use multiple repositories. Browse and search for functionality/components. 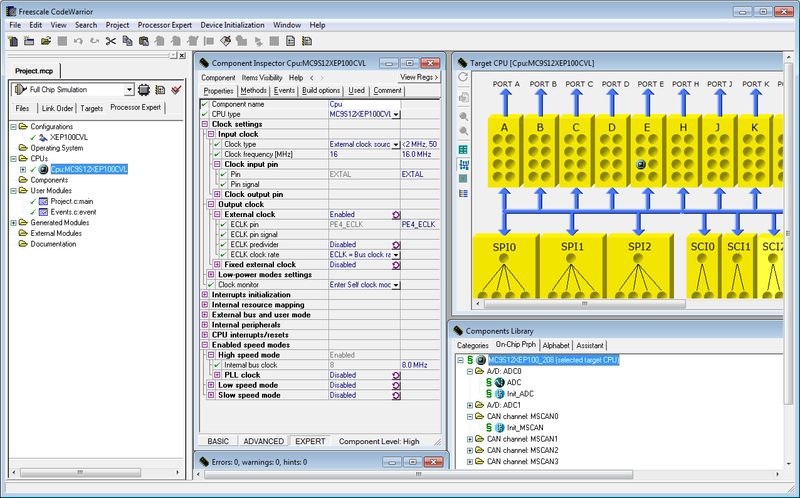 If functionality is not provided by Freescale, need to add/create own or 3rd party component. Broad range of components, typically cover on-chip functionality. Very few ‘off-chip’ components available like sensors or other external components. Freescale only provides components for Freescale devices. Graphical user interface with online help with ‘help on component’. Lack of documentation, tutorials and example projects. 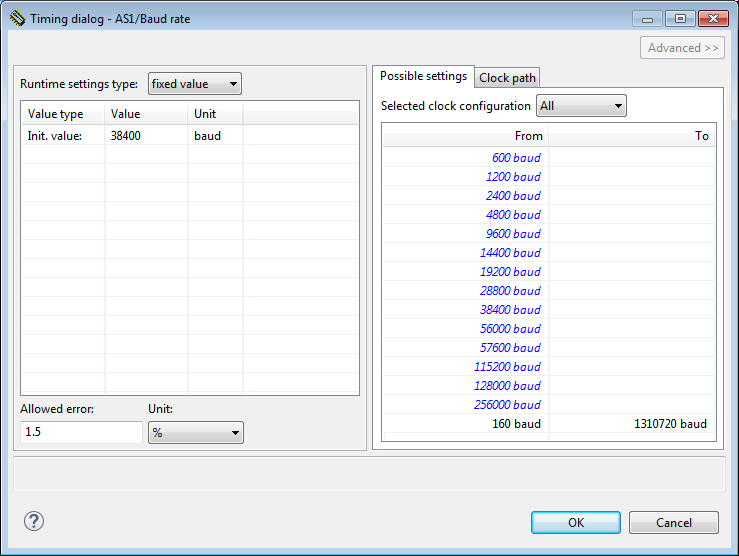 This can be easily used for bare metal and application with an RTOS. Of course if using a device from multiple tasks there has to be a synchronization in place. The biggest advantage of the ‘Beans’ is that they have a common API across different architectures, so I can use the same API/components across say HCS08, HCSC12, DSC and ColdFire devices. So porting an application from one architecture to another typically is a matter of hours. With the introduction of the Kinetis SDK a new type of components were introduced: the SDK components which have the “fsl_” in front of their name. 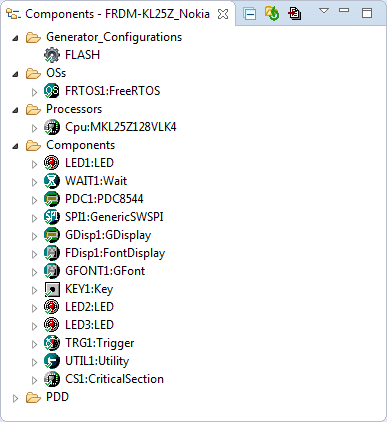 The SDK components itself do not generate the full driver. Instead, they generate the configuration structures for the Kinetis SDK. The SDK is using a HAL (Hardware Abstraction Layer), and for this there are as well ‘_hal’ components offered and which are used inside the ‘fsl_’ components. 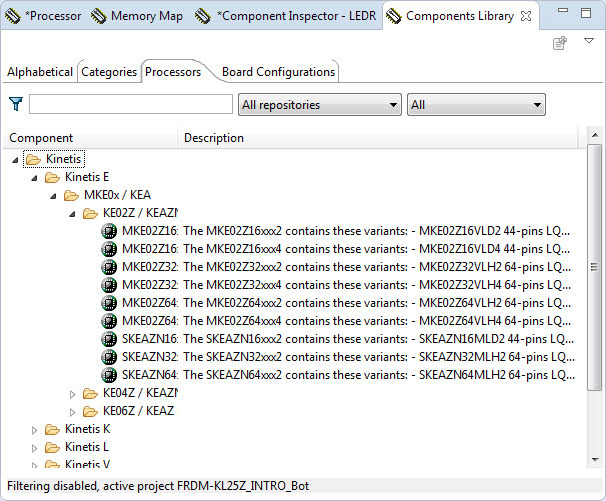 Even if these components do not generate the code, they offer an easy visual way to use the Kinetis SDK. Generic Device handle for LDD, easier to use it in an RTOS environment which uses device handles (e.g. MQX). 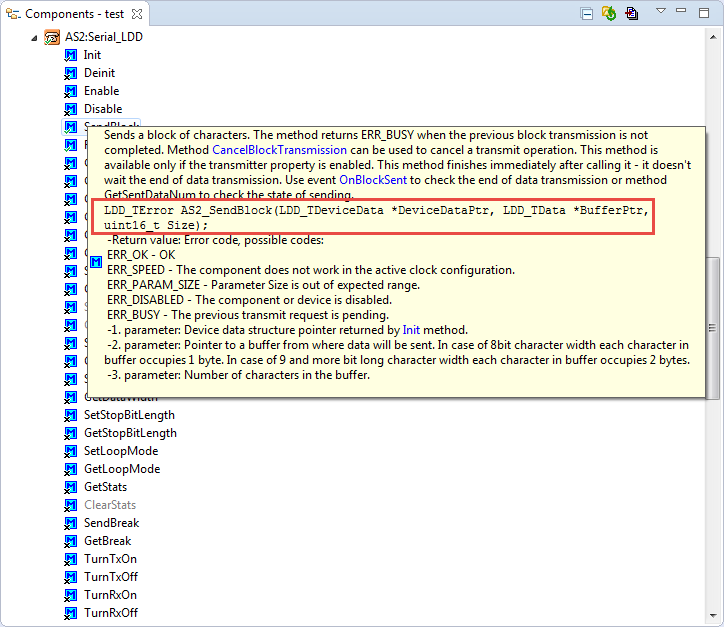 LDD API not compatible with previous applications using HLB components. ‘Static’ configuration and code generation with SDK components. Components are for ‘configuration’, not code generation. Easy and visual way to use the Kinetis SDK and HAL API. SDK components break again with previous projects. Components/projects cannot use/mix different components, no portability API. SDK itself adds complexity and overhead. Properties: Settings of the component which affect the behaviour of the driver. Inheritance: Multiple components can be combined or using links/interfaces to other components, in an object-oriented way. 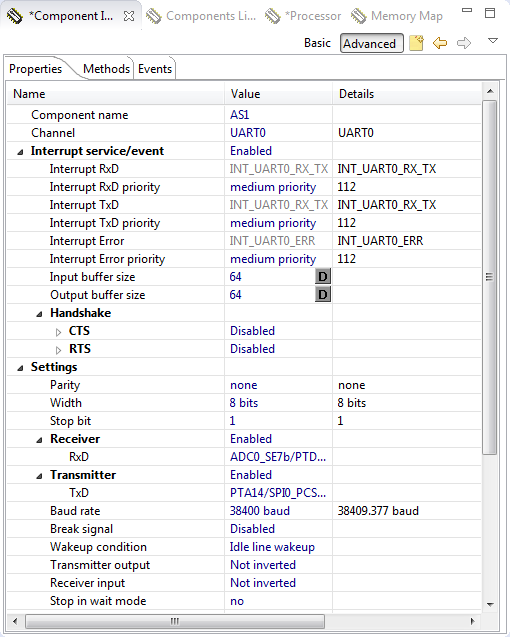 For example a UART component can inherit from a low-level UART component and build up a new interface with new functionalities. Methods and events can be enabled or disabled it not used (marked with a small ‘x’) in above screenshot. Methods which are disabled are not generated, and the component code generator might optimize the driver based on what is enabled/disabled. For example if there is no ‘GetStatus()’ method needed, then the component might not need to store a status somewhere at all. 💡 I’m showing the ‘classic’ view in above screenshot. There is a ‘tab’ view (default) too, but that tab view in my opinion is much harder to use, so I recommend to use the ‘classic’ view. See “Switching between ‘tabs’ and ‘no-tabs’ UI in Processor Expert” for details. ** transmitter property is enabled. If I’m not happy with the generated code, I have the option to ‘freeze’ the code generation of a component. See “Disable my Code Generation“. Easy and simple way to have a driver. Still need to understand how the hardware works to some extend. Graphical UI for configuration. Requires IDE integration (Eclipse). Consistency checking prevents wrong or bad settings. Consistency checking requires time, slows down the tool. Sometimes ‘rekursive’ dependencies are not properly resolved. Generates driver code and example code ‘which works’. API and coding style might not match own preferences. Because the driver need to deal with many different use cases, it is not the most efficient one (code size, speed). In case the generated functions and methods are not enough, there is a lower layer of API which can be used: the Physical Device Drivers (PDD, see “Low-Level Coding with PDD (Physical Device Driver)“). Basically the PDD are low-level macros which can be used to access the low-level functionality of the device. Because the PDD macros are tight to the device used, they are not much portable between different devices. Small and tight code. Hard to understand API and how to use it. Access to low-level peripheral function. Macros are device dependent, not portable. Graphical UI to drag&drop macros/functions Lack of documentation. Ability to turn on/off functions to optimize the code. Sometimes unclear what the impact of enabling/disabling functionality will be. Easy way to generate code “which works” or can be used as reference implementation. Code sometimes not ideal, or not very well documented. Automatically checks for dependencies, configures the pins and clocks for me. Checks for conflicts. Still need to understand the microcontroller. Making bad settings will result in bad results. I can disable code generation and do my own changes. Freescale provided components are ‘closed’: I cannot edit or change them. I wrote a tutorial “Tutorial: Creating a Processor Expert Component for an Accelerometer” how to create my own components. Newer Processor Expert releases come with a Java based/Eclipse plugin to create/change your components. In classic CodeWarrior there was the ‘BeanWizard’ (standalone), but this one required a paid/Professional CodeWarrior license. Can create my own components. Not easy to learn, takes a lot of experience. 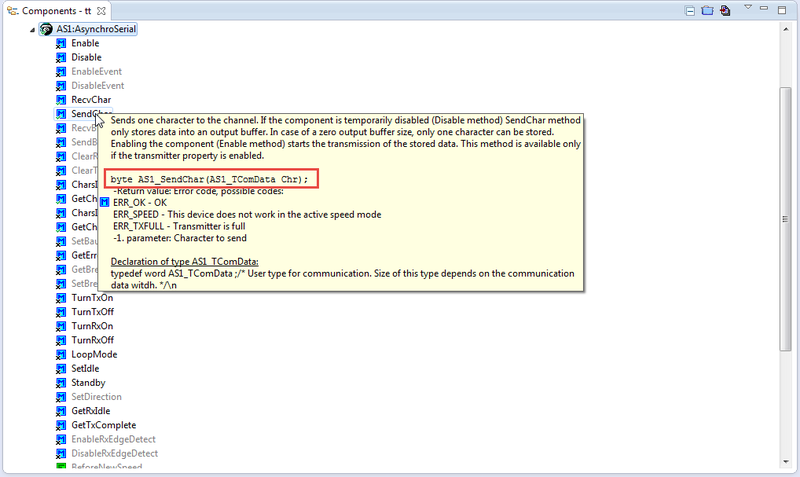 Free license (Eclipse plugin) Cannot sell components, cannot create Processor components. Classic BeanWizard is not free of charge. Graphical wizard and user interface to create components. The CDE plugin in Eclipse is not very mature and not as easy to use as the ‘classic’ BeanWizard. 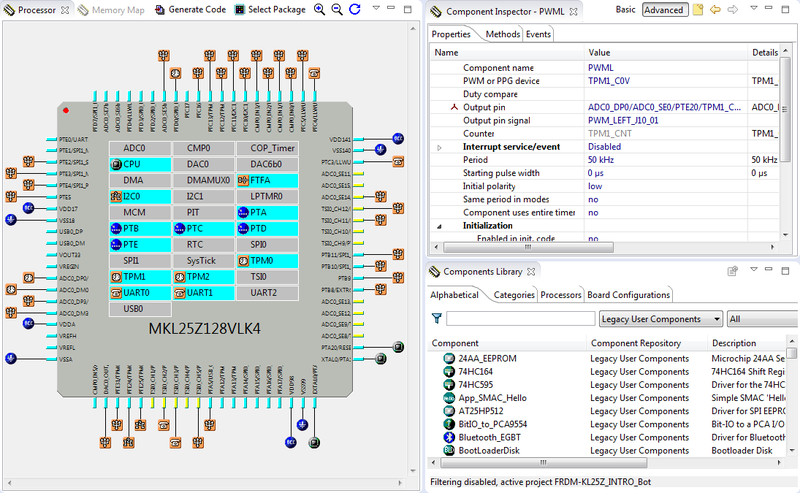 The other big advantage of using components is: as the component interface remains the same, and because Processor Expert is available on multiple Freescale platforms, it is very easy to move projects between different derivatives. For example I have my INTRO Robot application running on Freescale S08, ColdFire and Kinetis (ARM), all with the same set of components. So Processor Expert makes it really easy to move from one device to another (e.g. Kinetis KL25Z to Kinetis K64F) or from one architecture to another (e.g. HCS08 to Kinetis KL25Z), or from one toolchain to another (e.g. CodeWarrior to KDS or to any other Eclipse IDE). 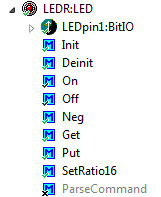 Change the component settings to use the new pins on the new board. 3 component types supported: HLB (High Level Beans), LDD (Logical Device Drivers) and Kinetis SDK. I know this is a rather long post, and I hope it gives an overview for newbies what Processor Expert is: A component based framework which encapsulates software with a graphical configuration front end. There is much more behind this framework, including automated build and generation support. Of course no tool is perfect, and no tool fits every need. The problem I see is that the framework should be faster especially for large projects. But the biggest disadvantage (maybe Freescale might say that this is the key feature 😉 that it exists only for Freescale devices. So once someone has explored the power of it, it will be hard to move to another vendor. To me, Processor Expert is like C++: it takes some learning and time to master it, but then it is incredible powerful. Sometimes I feel like at the old days when C/C++ compilers got introduced, and everyone was using assemblers: high level language was considered as slow, inefficient and “I can program this better!”. But today there is no argument about using compilers because they have both improved and second we need to be more productive. And everything else looks like stone age ;-). This entry was posted in ARM, CDE, CodeWarrior, ColdFire, CPU's, DSC, Eclipse, Embedded, Embedded Components, FreeRTOS, Freescale, HCS08, KDS, Kinetis, Processor Expert, S12, S12X, SDK, Thoughts and tagged Eclipse, Embedded Component, FreeRTOS, Freescale, Processor Expert, software, technology, Thoughts, Tips&Tricks by Erich Styger. Bookmark the permalink. Very timely and great overview! 2) There has been reluctance in adoption within Freescale organization. On one hand it is good to see PEx examples in KDS, on the other hand, during 2015 FTF very little was talked about PEx in technical sessions – probably for the first time. I agree with you that once you start using PEx, not using it is like going back to the stone age. I sincerely hope that it remains a focused enablement tool under NXP umbrella too with more adoption and promotion by new organization. many thanks for your thoughts. I think it is a great technolgy, and I noticed your observation at FTF too when we talked there. Processor Expert to me was first in the market with that new approach, and when you look around at this time every other vendor has realized that and has now a similar technology in their portfolio. I whish there would be something like this available as a cross-vendor technolgoy/tool, like Eclipse so it would not be vendor centric. Great overview. I’ve come to know PE through your fantastic blog. I’ts really helped learn the Kinetis devices, particularly the clocking. I really appreciate some of the realistic examples you’ve used to show how the silicon can be tickled. Unfortunately what stands out is lack of usage/recommendation by Freescale Support, and recently I’ve come to doubt whether Freescale with their ecosystem of partners are upgrading their ability to be able to educate people using their product. So fantastic tool, but requires some Freescale commitment that I don’t follow. I’ve also used mbed – which was incredibly productive till I went off the edge of supported processors, core libraries. So its only good if the processor/library is supported – and that makes it a training/prototyping tool. My method of using PE/KSDK1.x (and other tools) has been to focus on edge issues that are a challenge to me – currently that is USB HOST CDC/MSC . I’m looking for a connected device (IoT) that is easy for a customer to assemble components in the field through PlugNplay USB. The PE libs provide quick ways of prototyping solutions for FatFS/SPI microSD, SPI Flash as do some of the KSDK_1.3 examples that can be imported into KDS3. For Iot users (in low power nonLinux) the North Bound internet traffic connection is painful – wireless WiFi, BTLE, Cellular Xyz flavour, terrestrial country specific = and USB PlugNplay wireless devices could solve this. So I try out code libs, compare against KDSK1.3 examples, keep a long list of ways that don’t work and try and find out ones that do work. Its been very slow and unproductive. The end goal is a stable code base running on processors configuration with enclosure that works for an end target customer base. Stable code to me is built slowly, doing integration tests – and for that PE is not useful. PE helps identify modules that can be unit tested for functionality/hardware integration- but then have to be moved out into a source managed base. PE works to help define a board support package. A really valuable environment is a developing knowledgeable community like the forum.microPython.org – with a distributed knowledgeable open source team, defined accesible development environment (make/github) that has a deep knowledge of the software stability and is able to add functionality and maintain stability as it goes along around their pyBoard. Eric really appreciate the blog and sharing methods, and training the next generation in great ideas. Thanks for all your thoughts and very good points. Yes, good point on mbed too: it is really a ‘walled-garden’ and nearly impossible to exlore it outside the supported platforms which are basically demo boards. Not sure if ARM will be able to turn this around with their IoT strategy. And I agree wtih your observation on the drivers (e.g. USB), that was the reason why I wrapped up my own USB component around the Freescale USB stack to make it easy to use. While Processor Expert has good support for the low level peripherals, what is lacking is the support for external devices. The same problem I see with the Kinetis SDK: there is no support/driver to reach out to the external world of devices. What I wish is that there would be a good driver library for all the actuators and sensors out there, at least for the most common ones. I have looked as well at microPython.org: that project looks very promising, indeed. I’m confused with the SDK components. If this components do not generate code, what’s the point? How is the SDK used then if there is no code generated? Or I think I didn’t quite understand the concept. If possible, could you explain a bit further using for example the UART? 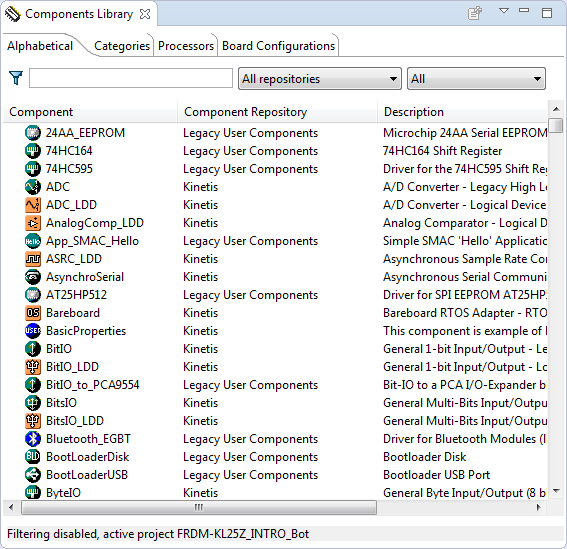 in case of the Kinetis SDK, the Processor Expert component is not creating the full driver code (as it would for non-SDK components). Instead, it creates only the files for the configuration of the SDK driver. You can see the files if you right click on the component and then use the Open File menu.